After posting this for fellow artists on Wetcanvas, a couple suggested a change to the background colour. They were right and so here is the final final version! I have finally finished this portrait. I have enjoyed it but it has had one or two moments that I did struggle with! It's always the same towards the end though - I start to fiddle with it and have to be firm with myself about deciding that it's done. I don't think I am going to do any more to it now. I'm probably about two thirds of the way through now. Her white dress will take quite a few hours with all its folds and shadows. 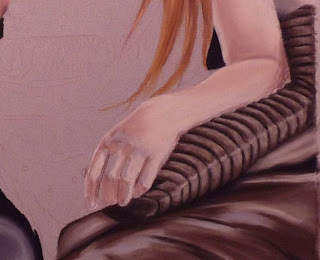 I like painting hands because they are very expressive, and I often find that the rough stage with the sharp tonal values has a very pleasing effect. I am starting on the skin and although the rule of thumb is to start with the dark tones and finish with the highlights, I like to get the values down first. I usually start with the largest area which in this case is the highlights. Today was a brilliant day for getting on with some painting! The weather was perfect - dull grey, with a chilly wind and squally showers. No temptation to get outside and work in the garden or go for a walk. Starting to fill in the figure now. I don't really have a rule about what I do first except to try and work to avoid getting dust from the dark colours onto the light areas!! Background finished. I'm really pleased with the way the leather settee has turned out, I just hope it doesdn't end up dominating the picture. My current 'studio' - soon to replaced with a conservatory this summer.Yipee, more room, more light! Yesterday, I started a painting of a beautiful little girl with the most wonderful deep red hair. She was so good when I was taking the photos and I have high hopes for this painting. Next - correct a couple of slight mistakes!